Copper toxicosis in Bedlington Terriers is based on a disturbance of the copper metabolism, resulting in an accumulation of copper in the liver and other organs. Copper accumulates in the cells where it damages mitochondria, due to the malfunction of it's revulsion by the gall. This causes cell death, chronic hepatitis and cirrhosis of the liver. In some cases, necrosis of the liver occurs which leads to the release of copper in the bloodstream followed by haemolysis. The late onset of symptoms in affected dogs results from a tardily process damaging the organs. Uptake of zinc and special drugs abate the symptoms. 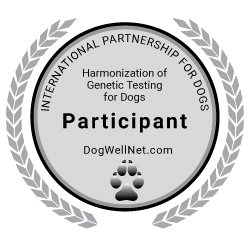 The DNA test is performed out of EDTA blood or buccal swabs. Required swabs can be ordered free of charge. (Buccal swab order-form). If a swab is sent in, possibly the genetic material is not sufficient to run the test. In this case it would be best to send in an EDTA blood sample.